Do you want to know more about the things I like? On my eldest niece’s last birthday (she turned 23), I got her the “The 52 Lists Project” book by Moorea Seal. The salesman at the shop sold me on buying the book, saying it was a very popular item. Then, I started seeing this same book pop up all over the place. Luckily my niece exclaimed that she loves writing down lists & journaling, so I was relieved to have picked this book for her birthday gift. I, myself, had glanced through the lists in this book & had come upon one list in particular that I quite liked. 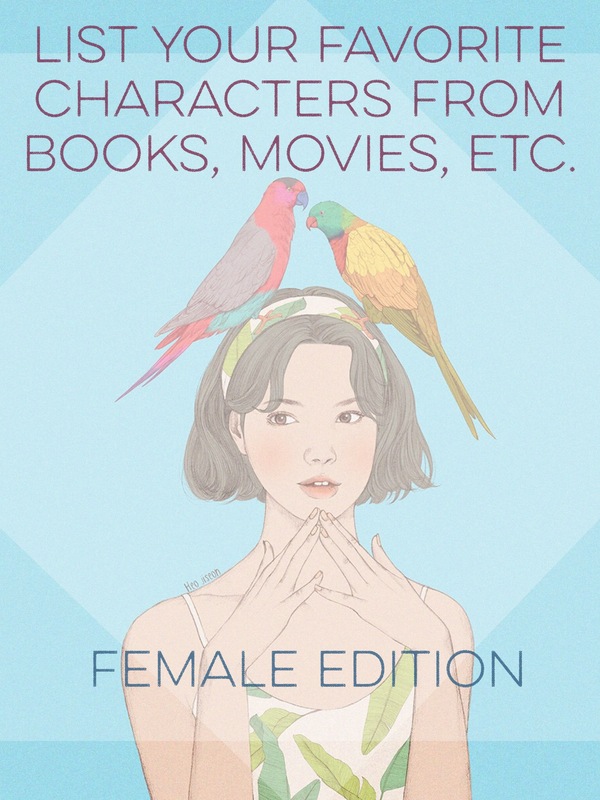 It was List 2 titled “List your favorite characters from books, movies, etc.”. I started to think about what my picks would be, & originally I had chosen this list because I thought it would be easy to answer. I was so wrong. I had a difficult time choosing my answers. I was very consciously trying to not be so clever that it made me appear phony, or like I was trying hard to sound cool. I really truly wanted to choose thoughtful, meaningful answers to this list. I gave myself an extra challenge by changing the list to only female characters. That made my discisions even more difficult, but I think I’m happy with my final list.